An endorsement from Tom Bordonaro must be like a kiss from a chocolate-covered angel. Or maybe I’ve got it wrong. Endorsing Katcho Achadjian must be like kissing a chocolate-covered angel. Mmm … heavenly. Confused yet? So was I. I’ve been scratching a hole through my skull trying to decipher the stunt Tom had to pull just to endorse Katcho. Tom, a former assemblyman in the district for which Katcho is now running, was chair of the Republican Party of San Luis Obispo for several years. As such, he wasn’t able to make an individual endorsement in the primary. Then he threw it all away—the title, the glory, the piles of gold ingots (that may be conjecture)—and scrawled his name on Katcho’s list of official buddies. After penning a 163-word press release, it was over and done with. I kid you not. The day after turning over the chairmanship, he sent out his brief, bland endorsement. Talk about buyers’ remorse. I dunno, something smells funky here. It’s got this rotten-eggy quality to it. Or I may be having a stroke brought on by all that head scratching. I’ve since picked through Tom’s campaign finance reports. Oh, did I not mention that he’s the SLO County Assessor running for re-election this year against, um, well, no one? There was another guy in the mix, Fred Aguiar, but he stopped filing paperwork at the end of 2009. That leaves the field wide open for Tom to enjoy a sweet, creamy, unopposed campaign. But for some reason, he still raised $3,999 in contributions since January. And he’s spent $38,135 this year. And he has an outstanding debt of $30,587. Apparently he’s been campaigning like it’s 1999 and others are out to get him. I’m going to scratch myself stupid. Tom’s in debt up to his eyeballs to Tom Bordonaro, Jr. and Bank of America. On one page, for instance, he reported a debt to Bank of America for $14,125. That’s just one page, and everything was listed under “office expenses.” This is only a small sliver of his debt—at least as far as the last reporting period, which spanned Jan. 1 to March 17, for an election he can’t lose. Tom could have taken those thousands of dollars and actively campaigned against himself, and he’d probably still win. I’m scratching straight through my left hemisphere at this point. Unless you’ve been living under a rock—or purposefully ignoring the insanity, as I have—you’ll know that the June 22 special election for California Senate is barreling down like a train from hell. Think Thomas the Tank Engine with a crystal meth addiction. The top two contenders, Democrat John Laird and Republican SLO golden boy Sam Blakeslee, are neck and neck in the latest Fairbank, Maslin, Maullin, Metz, and Associates poll. They’re at 32 percent and 33 percent, respectively. Given the political potential for squeezing a Dem into a historically Rep seat, the money and the endorsements are pouring in. Laird’s got the endorsement of every Democratic county supervisor in the 15th Senate District. Every endorsement, that is, except the three Dems in SLO County: Jim Patterson, Bruce Gibson, and Adam Hill. The smart money says no one’s jumping on the Laird campaign because they don’t want to screw the pooch with their chum Blakeslee. And that, my friends, is what a whole lot of ink wasted on talking about endorsements looks like. Personally, I care less about endorsements than the people who give them. Apparently, though, the New Times nod is a coveted campaign booster. The staffers here have been tooting their own horns over the record-setting response numbers in the last two online polls. Usually a dismal 200 respondents are enough to get the horns tooting. After posting polls on the sheriff and assembly races, however, the numbers blew up like an Icelandic volcano—except we didn’t ground any European flights. Don’t get too excited, fellow New Times-ers. As it turned out, the candidates who advertised the poll on their Facebook pages got the most votes. Sorry, but does this really do anything for your campaign other than reflect that your supporters are willing to show their support by clicking a mouse? Secondly, is the New Times bump really something you think will push the election in your favor? I hate to break it to you, those who treated the online poll like a golden calf spurting some sort of election-winning potion, but I’m betting all you’ve managed to do is invigorate the people who already support you. Thanks, though. Moving on. Who else is sick of this boring will-they-won’t-they routine between the Downtown Association and the Farmers’ Market Association? First, both sides were squabbling like a bunch of Muppet babies. Then they purportedly made up, like, well, the Muppet babies. Then it turned out they’ve actually been squabbling ever since the first squabble they said was over. Now they say everything’s OK and they’re back to spooning. I don’t think the Muppet babies ever did that, even though Miss Piggy might have wanted to with Kermit. If you watch and listen to the Downtown Association membership speaking in public, however, their jaws clench, they rail against a “media campaign” crafted by the Farmers’ Market Association, and they refer to the farmers as incapable of managing themselves. Could the fight, possibly, not be over yet? Maybe they’ve piped down long enough so the next blowout will come too late for the city to fiddle with the Downtown Association’s contract. This all feels like when your parents have finally stopped fighting in front of you, but you realize it’s just because they’ve been filing for divorce. And now we have to sit at the breakfast table trying to finish our Cheerios and pretend like nothing’s wrong. But, on the bright side, maybe we’ll get a puppy out of all this? Want an endorsement from the Shredder? 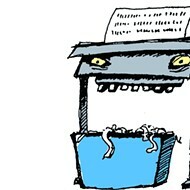 Send requests and bribes to shredder@newtimesslo.com.